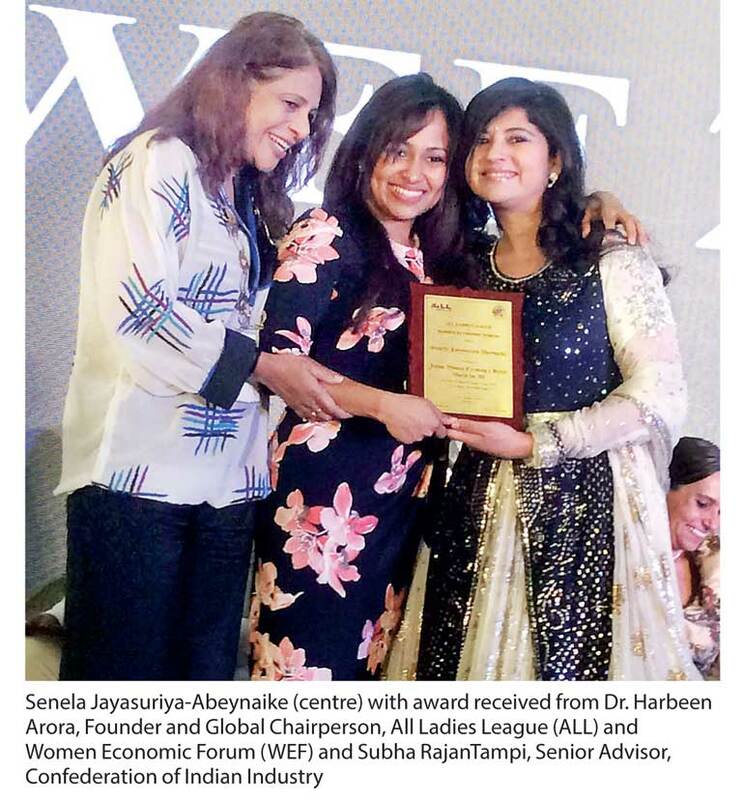 Senela makes Sri Lanka proud as the first and only Sri Lankan to represent the country with an award in the history of the Women Economic Forum. The Annual Women Economic Forum gathered women leaders and entrepreneurs from 100+ countries at its mega marathon spectacular conference in New Delhi spread over six days. From 8 to 13 May, a rich confluence of leaders and achievers from around the world empowered one another by sharing and speaking across 520 sessions and workshops under the overall bold theme of ‘Women: Creating, Innovating, Understanding and Driving the Future’. “We have all heard about the glass ceiling, where women experience various barriers due to their gender. But what if I told you that the biggest glass ceiling is yourself. There are mental barriers and inhibitions we tell ourselves as women that keep us from trying. And for those of us who do try, one or two bumps and we give up. Real success starts with the mind – inside the mind! You can only go as far as you tell yourself. If you believe you can – you will. With that mindset, it’s guaranteed, because you open doors to limitless possibilities,” commented Senela. Senela has always been an avid believer that women can make a unique social and economic impact and contribution to society and the world. She recently embarked on her long-time dream to offer a specially designed economic empowerment programme and leadership development program for corporate executives and start-ups (entrepreneurs) under the banner ‘Women Empowered’, which is dedicated to empowering women to be confident, influential, impactful and successful. Senela was appointed as an Advisory Executive Council Member and session lead speaker at the Women Economic Forum and she made a special address under the AEC plenary ‘Understanding the Century of Social Media and Personal Branding’. She is a Transformation specialist, Leadership trainer and an Executive coach and has held many positions in leadership and strategy both in the corporate sector as well as in the service and advocacy domain. She is the Corporate Training Director of the McQuire Group of Companies and has trained teams from some of the biggest multinational and public listed companies in the country. Senela is an acclaimed corporate trainer and management coach commended for her unique and engaging style of delivery and works with Fortune 500 companies on communication, leadership development, employee engagement, productivity and team performance. Her expertise are in Business, Marketing and Brand Communications, Strategy, Presentation and Public speaking, Personal branding and personality development, Executive coaching and Customer Service. Please email womenempowered@mcquire.org to get in touch with Senela. The Women Economic Forum was an extensive program that was carried across 41 theme verticals and 520+ sessions with meaningful dialogues on topics that engaged the needs of participants from different fields, cultures and backgrounds. Countries and embassy representatives also presented opportunities therein for business, education and tourism, and special outreach for women.